Retune: The ReTune tab in the Loopeye editor gives you complete control over the scale and key of any tonal loop and can even work with polyphonic material. The ReTune algorithm, developed by zplane.development, analyzes polyphonic and monophonic sound material in realtime and transform it to the desired key and scale while retaining high audio quality. 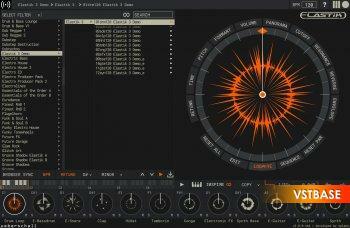 New Interface: Elastik's central Loopeye forms a detailed loop-editing tool. A large number of parameters can be adjusted, including volume and pan, reverse, formant, filter and resample. Each parameter can be altered on a per-slice basis. Browser and Loopeye can now be viewed side by side. Inspire: Elastik includes a random sound replacement function called Inspire. One click on the Inspire button and Elastik will select a random loop from the same instrument group. You can define which soundbanks will be used in the Inspire tool with the new Inspire browser. Retune: polyphonic scale and key shifting. Timestretch and pitchshift in best quality. Fast browser features (multiple filter search, tagging). Prelisten in BPM, key and scale sync. Sequence mode (loads of editing features per slice). Random sound replacement via Inspire. Bounce of original and modified loops.